At last, it is possible to recycle buildings you don’t want anymore! This feature was asked by many of you beta-testers. Though being the last tab of the list, it’s one of the key actions in Stormland, where you will need to spare every single piece of resource available to you. And it’s still better to recycle objects to create a stronger building, than seeing your old cabin blown by the elements…! Also, there’s no “destruction” option to get rid or relocate a building (materials don’t vanish in thin air, right? ), so Recycling is the answer to that. This time, we’re also adding less destructive manifestations of nature ; here come the waterfalls! They will later be needed to activate certain buildings waterwheels. 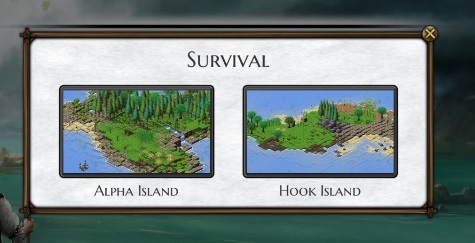 For our early testers, we’re also adding a second map, you can now choose the map you want after selecting the Survival mode. One day those maps will be replaced by a random generator !